Katriona Chapman’s Follow Me In is the recent subject of the Enemies of the State Podcast, a brand new podcasting project from Sequential State and Your Chicken Enemy. The first part of that project is the actual conversation, which you can read more about here. The second part of that project is an encouragement to all participants to write reviews of the book under discussion. This review is me fulfilling the second part of the stated goals of the project. Please expect reviews of Follow Me In from some of the other critics who participated in the show; I know Dan Elkin and Rob Clough are working on theirs now. Follow Me In is a full color 248-page hardcover from UK-based publisher Avery Hill Publishing. 2018 was a big year for Avery Hill, and it culminated with a release of this book along with work by cartoonists like B. Mure and Tillie Walden. 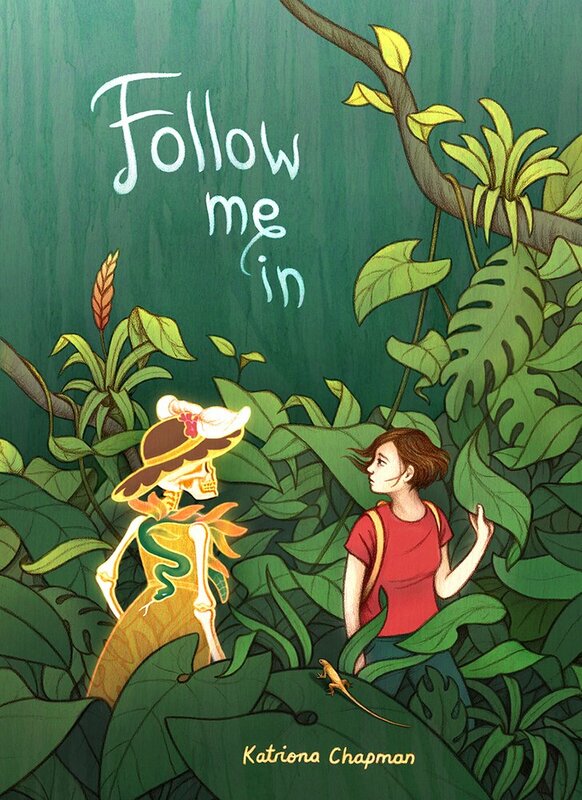 Follow Me In is a graphic memoir and travelogue, detailing a 9 months-long trip to Mexico that Katriona made in the early 2000s. 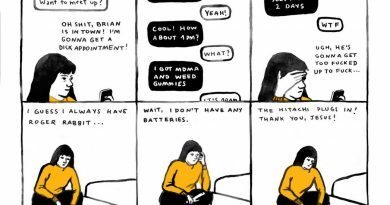 In this comic, Katriona tells the story of her travels, her growth as a person, her rediscovery of herself as an artist, and the tumultuous and difficult relationship she had with her alcoholic ex-boyfriend Richard. 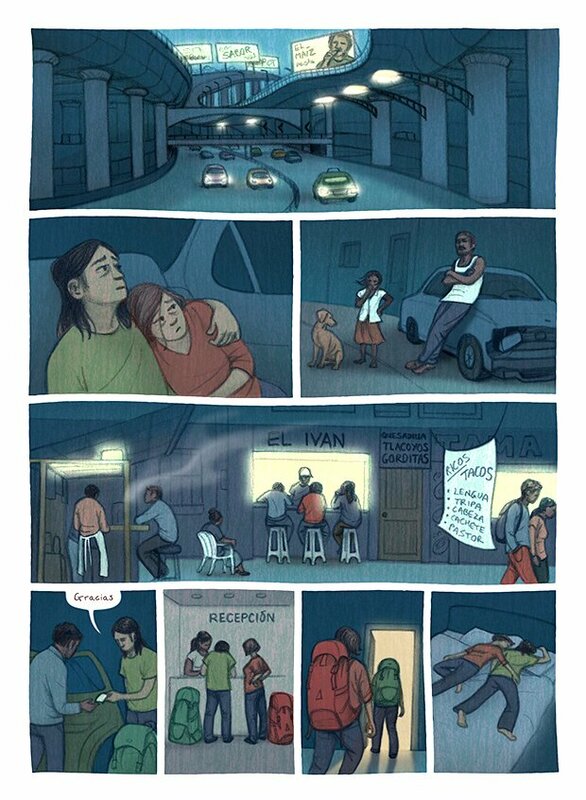 Chapman’s color work in Follow Me In is one of the book’s clear strengths. The illustration is accomplished and Chapman’s vibrant color choices work well given the setting. The decision to use colored pencil as the medium for this book is a perfect choice for the kind of warmth and liveliness that Chapman is attempting to capture in the Mexican countryside, and during a frigid North American winter, was a nice reminder that the sun really does exist. In some ways, Chapman’s ability to convey information through color was transporting. I found myself longing for a vacation south. Follow Me In isn’t just about a long vacation though – Richard’s alcoholism and binge drinking have a major effect on the tone of the work, and the conflict between Katriona and Richard is one of the driving forces of the narrative. Chapman starts the book with a meetup between the two people where Richard explicitly gives Chapman permission to tell this story, which is a unique feature to Follow Me In as far as I can tell – I’ve never read any comics memoir that goes out of its way to do that, even when behaviors depicted could be embarrassing or otherwise for the author’s subjects. As a first graphic novel, Chapman gets a lot right, but Follow Me In still had some issues. The cover of the book emphasizes a Dia de los Muertos image of a skeleton in a sundress wearing a snake as a scarf, and that snake appears throughout the book as a visual metaphor for the dangerous toxicity of Richard’s drinking. But the motif is used sparingly, limiting its effectiveness. Chapman’s illustration tends to stick towards the naturalistic, but the pages where these “magical realist” motifs are emphasized are the strongest in the book. Chapman’s comic is also a slow read, intentionally. 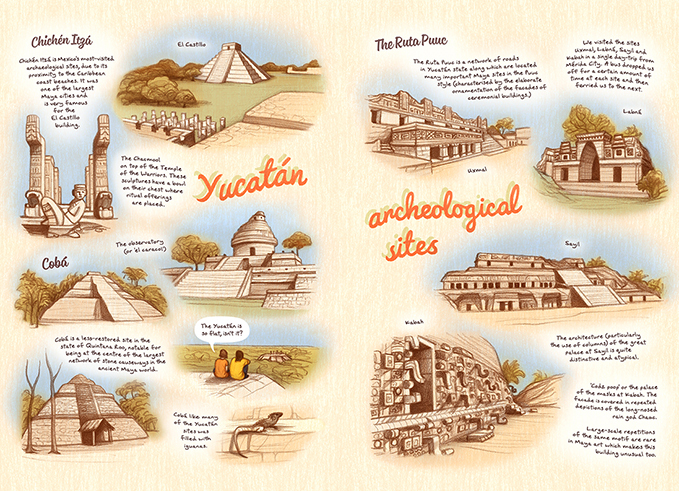 All of the scenes of the book are intercut with infographic pages, explaining the couple’s trip route and giving details about the area of Mexico they were visiting at the time. While this interstitial information was educational and gave me a better appreciation for what Chapman was seeing and doing, it also ground the narrative progression of Follow Me In down to a snail’s pace. I would have preferred the book move a little quicker. There’s also quite a bit of Mexican Spanish in the book, and using Google Translate to figure out what is being said isn’t always effective. You’ll have to get at least a cursory understanding of some Mexican slang. All of this was easy enough to put together given a little work and a standard Google search, but again, this slows down the book in ways that I think pull the reader out of the reading experience. Ultimately, I found Follow Me In to be a powerful narrative of growth and adaptation to adversity. Katriona at the beginning of the trip is a much younger, much less assured version of herself, and seeing her grow through the book is what makes it really shine as a memoir. While the pacing needed work, I found the Chapman’s illustration effective and transporting. 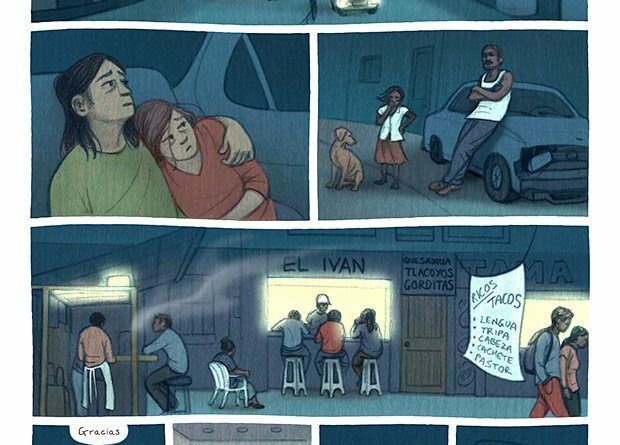 Follow Me In is lovely both as a travelogue and as a love letter to Mexico. Someone pass the sunscreen. Sequential State is made possible in part by user subscriptions; you subscribe to the site on Patreon for as little as a dollar a month, and in return, you get additional content; it’s that simple. Your support helps pay cartoonists for illustration work, and helps keep Sequential State independent and ad-free. And if you’re not into monthly subscriptions, you can also now donate to the site on Ko-Fi.com. Thanks!